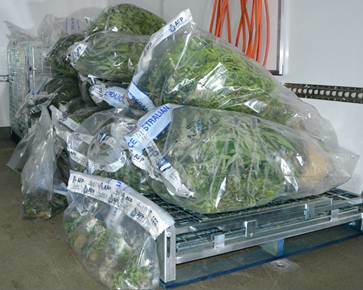 ACT Policing seized 32 cannabis plants yesterday (Tuesday, July 29) from a house in Ainslie after emergency services responded to reports of a fire at the location. About 7am yesterday, police attended and entered the unoccupied house. Officers located a room within the house which contained 32 cannabis plants and hydroponic equipment. ACT Policing North District Superintendent Brett Kidner said that given the nature of grow houses, the heat generated, and the electrical loads involved, fire is one of the many dangers to which people involved in this activity – and their neighbours – are exposed to. “Early investigations indicated that the fire was non-suspicious, and the hydroponic equipment is highly likely to have been the cause. Luckily, the fire was contained to one house and no-one was hurt. “This is the second illegal cultivation grow house detected in the area in the past few days. We would encourage people to continue to report houses they believe may be used to cultivate cannabis,” Superintendent Kidner said. The investigation regarding the cannabis seizure is ongoing. Police are urging anyone who may have information about the fire or information relating to suspected grow houses to contact Crime Stoppers on 1800 333 000, or via www.act.crimestoppers.com.au. Information can be provided anonymously.